So Good food blog has a thorough documentation of a guerilla marketing effort by Burger King. Evidently Burger King has been dropping wallets (so far in Chicago and Orlando) with cash, a map of area Burger King locations and a message telling the finder that he can also be a keeper. The message reads: "Attention would-be good samaritan: Don't worry about lost & found. The King wants you to keep this wallet and everything in it." Read the rest of the story and see more photos at So Good. Good Job !!!! Now can i have a Whooper Meal!!! Good strategy!! 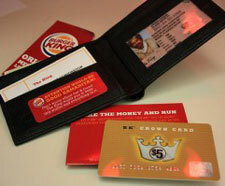 now more customers will visit bk and ask for there free whopper combo.